A few weeks ago I shared a post about Super Bowl Party Supplies I received from Oriental Trading Company. I also have mentioned a couple of times recently, that I would post what we did at our actual party. Since the Super Bowl was on Sunday night, and none of us were super invested in the teams playing, it was on the casual side with a handful of friends. 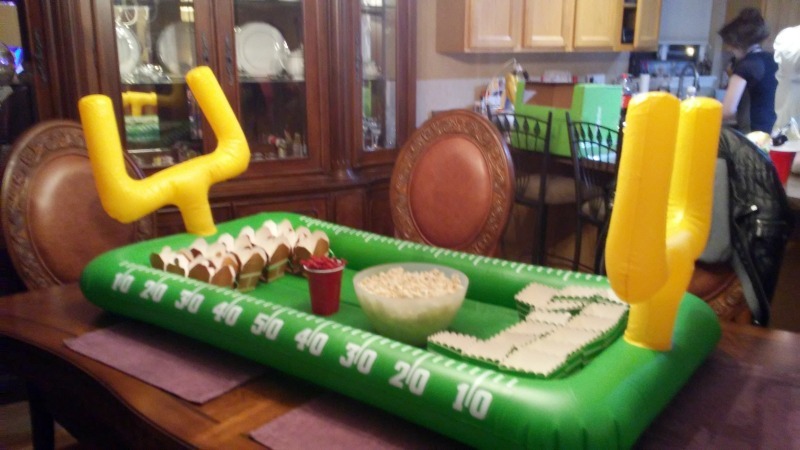 This time I am able to show a picture of Inflatable Buffet Cooler, because we had an air pump on hand. 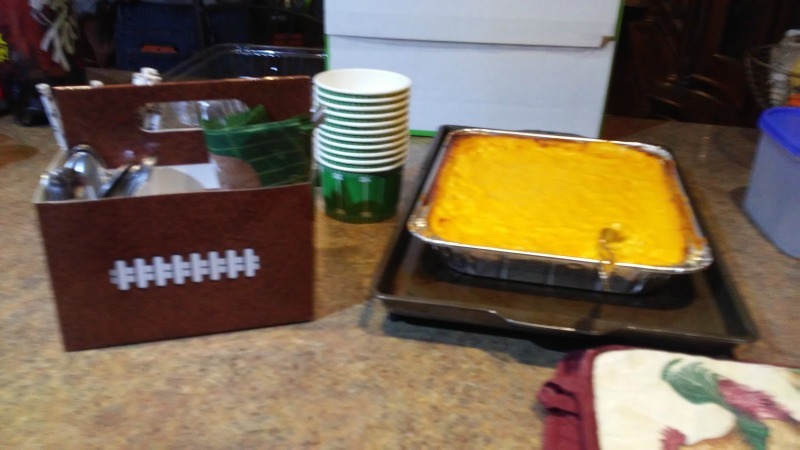 While it is designed to hold ice and more, we used it to hold some of our snacks and snack boxes. It is something we can use again for future parties. 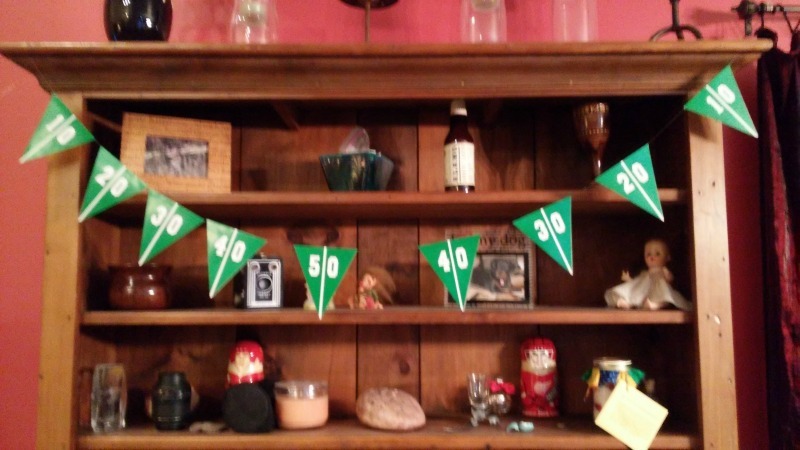 The football pennant banner looked great on my friends bookcase. We decorated right before the party started, so we got a little creative to get everything in place quickly. 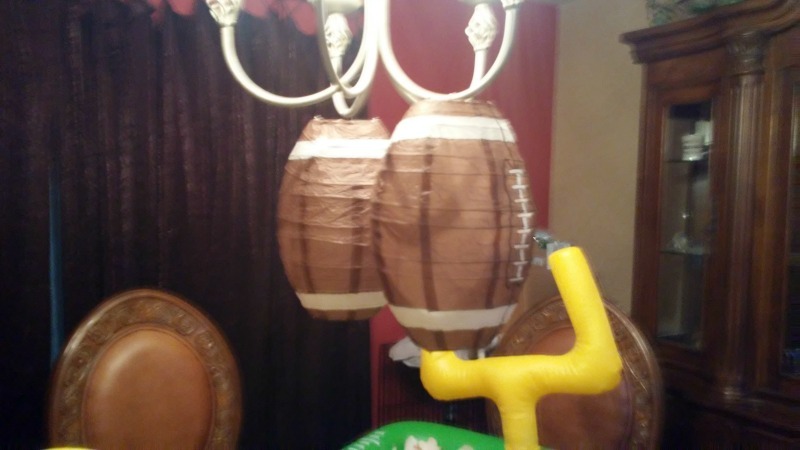 The chandelier over the dining table was a great place to hang the football paper lanterns. 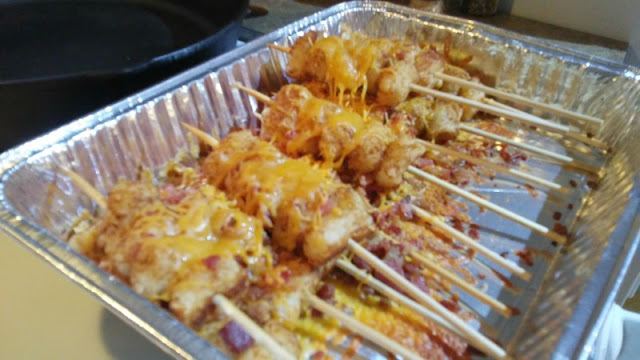 I brought cheesy tator tot skewers that I saw on Pinterest as my dish. They were super easy to make, and a big hit. I will be making them again, but in/on a different pan. I had to stack them on top of each other to bake in a disposable pan, so some of the cheese made a few of the skewers stick together. I thought I took pictures of all the food at the party, but once I got home I realized I hadn't. The rest of the snacks were party main stays.. popcorn, chips and guacamole, a veggie tray and dessert. 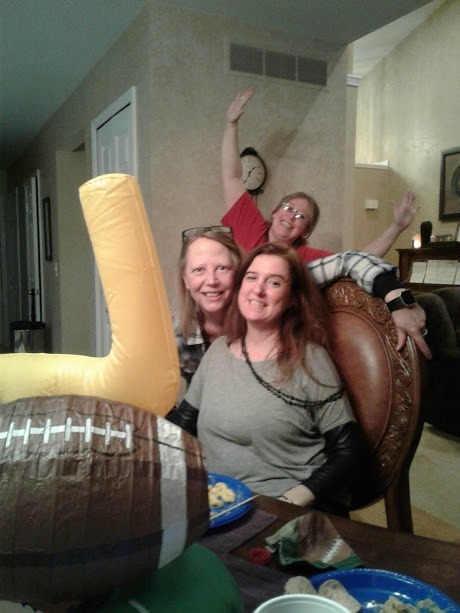 Even our pictures with the props (photo prop sticks, mini fingers, and football necklaces) that night were pretty casual. I took a couple on my camera, and a friend took some on hers. There was maybe only one or two pictures where there was not someone doing something goofy. Most of our pictures looked like this, with people not ready, and not looking at the camera. I have no idea what we were looking at here. 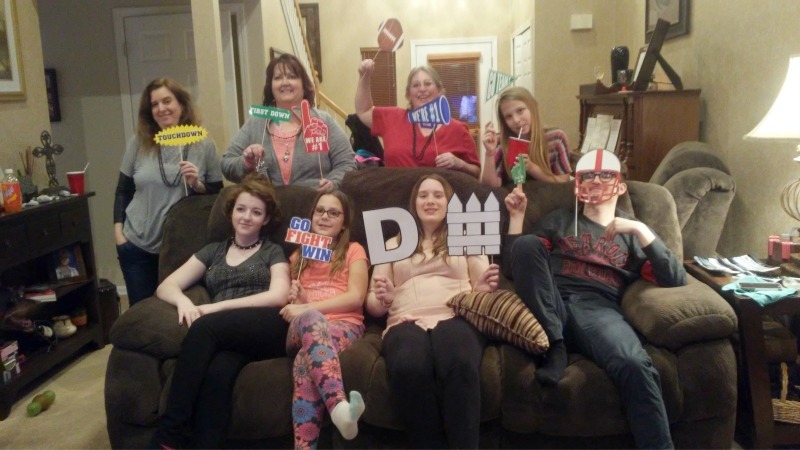 We got the kids involved with the pictures too, and still had some pretty funny shots. My daughter's favorite part of the night was bonding with my friend's dog. She loves posing for the camera. 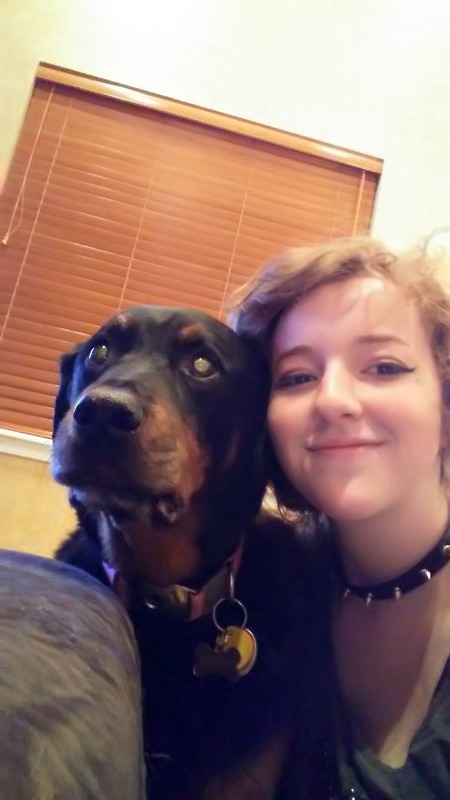 She did really well having a house full of people, and loved hanging with my daughter just as much. 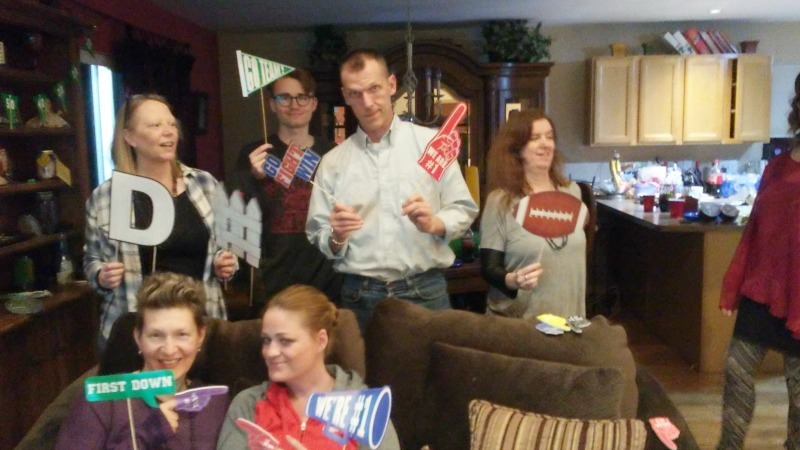 Our Super Bowl Party was a lot of fun, and it turned out to be a really good game. We are already planning our next get together.. I am not exactly sure what we will watch yet, but it looks like the theme is going to be a MOVIE NIGHT.